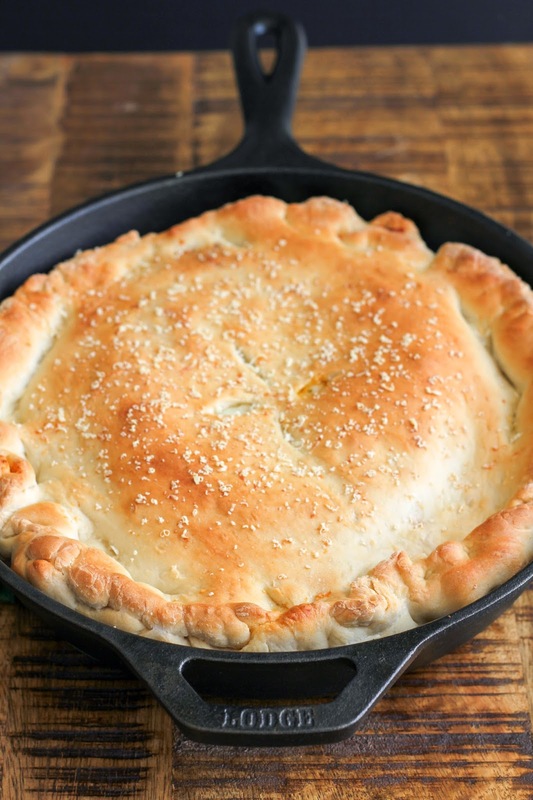 Use your trusty cast iron skillet to transform a calzone into an easy weeknight meal for the whole family! Pizza is a well loved food by every person in this house. My oldest son says he could eat pizza every single day, that's how much he loves it. Sometimes I make homemade pizza, other times I buy one from the deli at our local grocery store, and others I order from the nearest pizza joint. Don't judge me, we all do it!! As much I love pizza too, it's nice to have something a little different. Like pizza, but not a pizza. Catch my drift? Am I making sense? Or am I just babbling? Sometimes I often wonder! This calzone is seriously one of my best creations. Everything you love about pizza, but wrapped in dough. And you make it in a cast iron skillet. One skillet, that's all you need. It's perfect as a weeknight meal with a side salad or fruit, and works great as weekend lunch too. If you don't love sausage, feel free to substitute ground beef. You can also add other veggies, like mushrooms, if you'd like. Whatever your family's preference is will work just fine! Preheat the oven to 400 degrees. In a 10-inch cast-iron skillet, cook the sausage and onion over medium heat until the sausage is cooked through. Use a wooden spoon to break up the sausage as it cooks. Once cooked, put the mixture in a bowl and set aside. Let the skillet cool slightly, then clean it out with a paper towel. On a lightly floured surface, divide the pizza dough in half. Roll each portion out to about a 12-inch circle. Press one circle into the bottom and halfway up the sides of the skillet. Spread the marinara sauce evenly over the dough. Top with the sausage mixture, pepperoni, red pepper, then mozzarella cheese. Sprinkle the dried oregano over the top. Place the other dough circle over the filling and pinch the edges of the bottom crust and top crust together to seal. Using a sharp knife, cut four slits in the top crust. Sprinkle the crust with the Parmesan cheese. 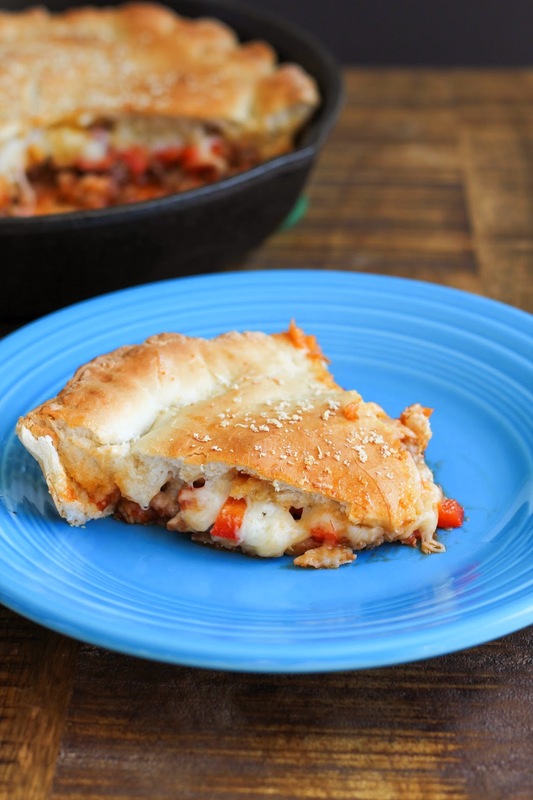 Bake the calzone for 25-30 minutes, or until the crust is golden brown. Let it stand for 5 minutes before cutting into wedges. Serve with additional marinara sauce, if desired.